Facebook has finally added admin roles to manage pages. Not sure why it took them so long maybe it has to do with the IPO who know but its great to page management. Now business can set permissions on what users can post, view or interact. This is a long waited feature that almost any blog offers so for Facebook to add this new feature is a great addition. Below is a graph that shows the user/admin roles. 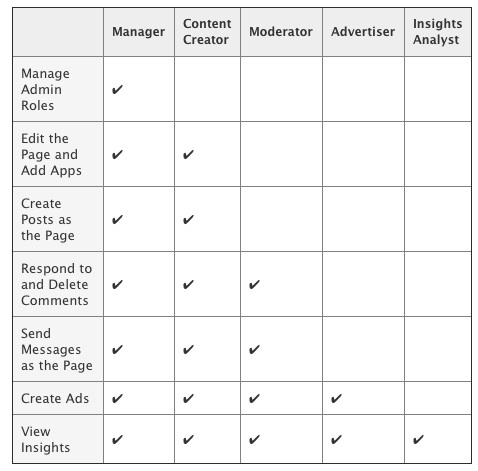 Pages admins can now have different roles, each with different capabilities — manager, content creator, moderator, advertiser and insights analyst, in order of descending permissions. Who can create pages posts, respond to and delete comments and create ads. Each administrator must be tied to a different person's Facebook page.